One of the most wonderful things about buying a prelit tree (besides them being down-right beautiful) is not having to mess with purchasing and adding lights every season – but a common fear is always…what if the lights go bad?? The reality is, it’s rare for light strands to go bad; instead, it’s almost always a super easy fix, like replacing burned out bulbs. Read below to find out Prairie Gardens Tree Experts top tips for making your lights last and troubleshooting any light issues. PLUS! THEY’RE GUARANTEED. WE FIX ANY LIGHT ISSUES IN STORE. Inspect: The most convenient time to look for any light issues is at the beginning and end of the season – before you put your tree up, or right before you put it away. Replace Burned Out Bulbs: Replacing burned out bulbs as they happen will help prolong all the bulbs on your light strands. Why? When individual bulbs burn out, the rest of the bulbs in the strand begin to work harder by taking on the extra voltage not being used by the burned out bulbs. Eventually this will cause all the bulbs on the strand to burn out. You can spot when multiple burned out bulbs cause all the lights to burn out: all your bulbs will have a black, silvery, cloudy ring around them. We call this “black death” and although it sounds bad, it actually means your strand still works, but all the bulbs on the stand need replacing. Loose or missing bulb wires: Sometimes a bulb’s wire may just be missing or pushed to the side. When this happens, the bulb will not light since the wires carry the connection. You may just need to straighten the wire, or in the case the wire is missing, replace the bulb. 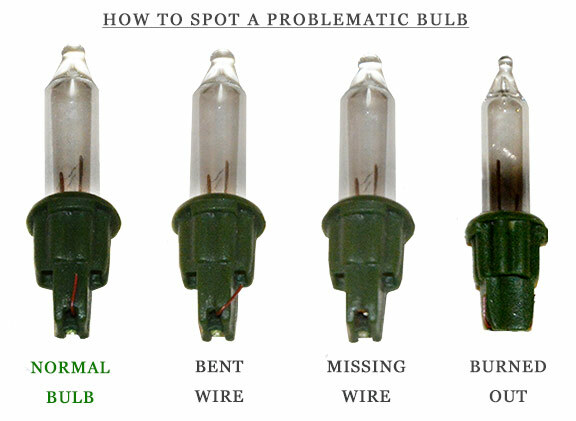 Know that it is likely the bulbs, not the strand: Strands typically do not “go bad” unless damaged. It’s often the lights that “go bad” over time. Replacing Bulbs: When replacing Bulbs, use the right voltage. The majority of prelit trees use strands that have 2.5V bulbs. However, make sure you still verify that you are using the correct voltage bulbs before replacing any. You can find the correct voltage on the tag that is attached to the plug of your tree’s light strand. Checking the Fuse: With most lights, it is rare you’ll ever have to replace the fuse. However, large bulbs, like C7’s, C9’s, G40’s etc, the fuse is the first thing you should check. If all the lights are out, the fuse is generally the culprit. *Watch a video tutorial below to learn how to change a fuse. Use a Light Keeper Pro: This tool will help you troubleshoot any light set issues in minutes, and it is the same tool our Tree Experts use. *Watch a video tutorial below to learn how to troubleshoot with a Light Keeper Pro. Can’t figure it out? Use us! We guarantee our trees at Prairie Gardens and our Tree Experts will fix any light issues. Use a Tree Bag: We highly recommend that you do not store your tree in the original box. They never go back in as easily as they came out, and pushing or shoving your tree can damage the lights. Let Your Tree Cool Down: Allow the lights to settle and cool for 30 minutes or so before taking down and storing your tree. Store in a dry place: Make sure you are storing your tree in an area where it will not receive any water damage, which can damage your light strands.